Coming soon to a screen near you…. In the next couple of days, we will be launching an exciting set of campaign films. The films will be sent to MPs and organisations, but we would also like to ask you to share these too. In the first of the series we hear from our Campaign Spokesperson, Jenny Sealey, who explains the importance of Access to Work. Next are a range of other videos by Deaf people explaining why Access to Work is so important to them. We really hope that these videos will raise awareness and help non disabled, non BSL/signing hearing people understand the issue. Why not send us a video! If you are an AtW user and would like to create a video for the campaign to use, please record yourself on an iPad or iPhone, or in a format compatible with YouTube and send the video to: emilysmith2007@mail.com. 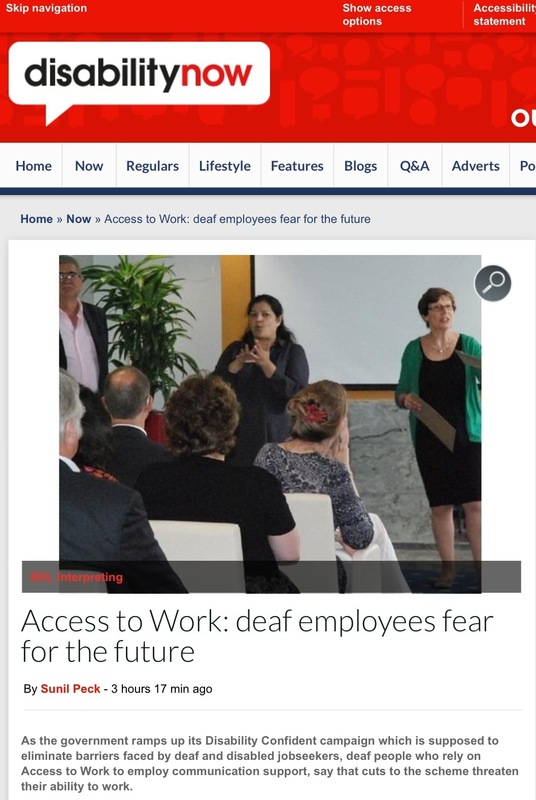 We hope Disability Now’s article will help to raise the profile of the issues that deaf people are facing with their Access to Work support, that is currently failing to provide access. We were very interested to see this coverage of the governments Disability Confident Roadshow on ITN this week. What was particularly interesting was the lack of publicity surrounding this. The cynics amongst us, might think that the government didn’t want disabled people using the opportunity to lobby. The governments rhetoric (message) does not match their actions. In the news item, the government continually says that their aim is to support as many disabled people as possible, and that they are trying to achieve fairness (!!). ITN interviewed Tracey Lazard from Inclusion London (who are one of our supporters), who was able to give the bigger picture for disabled people. She described the situation as “bleak”. Also interviewed was Deaf businessman Jeff McWhinney. It was shocking to hear him explain that he was now in a position where he was unable to manage his own company! He has employed a hearing manager. We believe this is due to the fact that he is unable to access critical meetings and events, thereby having a detrimental affect on his company. Finally, Liz Sayce was interviewed. We strongly disagree with her views, as we believe that these are giving the government an excuse for their current actions. She stated that employers need to accept more responsibility. During the Roadshow, Andy Green from DPAC (Disabled People Against the Cuts), spoke out. He raised the point that even with Access to Work support for the past fifteen years, employers have not changed their practices. Making employers liable to fund disabled peoples support, whilst barriers in the employment market still remain, is unrealistic and unworkable. We are very pleased to have the support of Teresa Pearce MP. Teresa tabled the recent parliamentary questions on Access to Work, and has been working tirelessly to get the issue debated in parliament. We approached Teresa as she had already been supporting a member of her constituency about AtW. As a member of the Work and Pensions Select Committee, Teresa is well placed to raise concerns over the current guidance and changes to practice and is able to ensure that our views are heard. Teresa fully understands the importance of Access to Work and the devastating affect the reduction of this scheme are having on the people it previously fully supported. 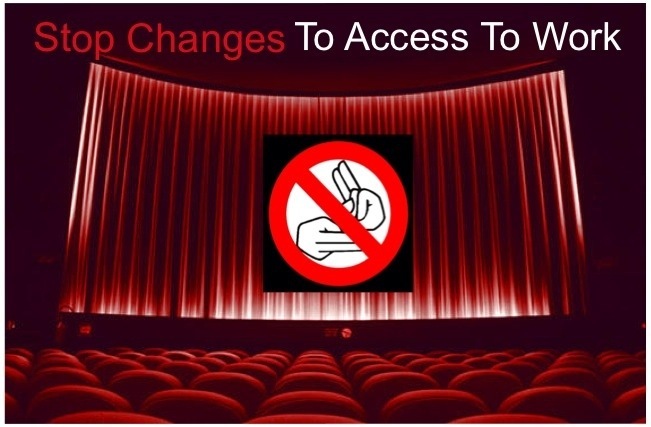 The aim of our campaign is to stop the unnecessary changes to AtW that are having such a detrimental affect on Deaf, DeafBlind and deafened peoples’ ability to work, their employability, and health. We continue to ask AtW, the DWP and this government to really talk with Deaf AtW users in order to keep the progress in Deaf peoples’ employment that AtW has helped achieve over the last 20 years. We continue to work with other groups wherever possible. 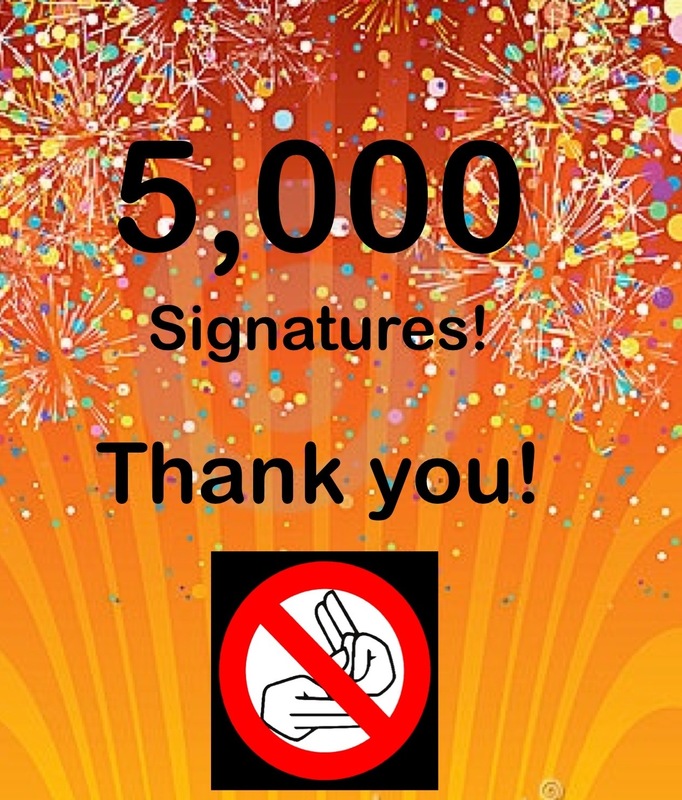 A huge thank you to all our supporters: 5000 Signatures! A huge thank you to all our supporters for helping us to reach 5,000! The petition isn’t closing yet, as we feel there is more work to be done before we are ready to present our petition to Iain Duncan Smith & Sir Malcolm Bruce. Please keep signing and sharing! DWP using “reconsideration” to drive down appeals. Access to Work users will be familiar with the “reconsideration” process. We are aware of countless cases of Deaf people asking for reconsideration, yet nothing gets changed and it often feels that little reconsideration has been given. What is the point of it then? The reconsideration process is there to drive down the number of appeals that the DWP are having to deal with. This is why it is essential that we all use the process and don’t give up half way through, as that’s what the DWP are hoping for! Please don’t accept support that is inadequate and doesn’t meet your need. You can use the http://www.deafatw.com resource to help you challenge the support package you are being offered. If you are going to the BDA deaf lobby day, you may want to raise the issue of reconsideration with your MP. The Stop Changes to Access to Work campaign is working hard to get Access to Work issues raised. Tell us your experiences of AtW. You can either post on our Facebook page, tweet us, or email us. Get in touch, we’d love to hear from you! The DWP are sending out masses of tweets claiming to give examples of outstanding disability confidence. They use the hashtag #disabilityconfidence. Our experiences recently show us that far from being disability confident, the DWP are disability incompetent. They are making it impossible for deaf people to gain, maintain and succeed in employment. “Job redesign” is the latest offering. Supposedly providing maximum independence. Not being enabled to do the job of your choice doesn’t sound much like independence to us. We are going to start using the hashtag #disabilityincompetent to highlight the issues. If you have examples of disability incompetency please tweet using the hashtag. You can include us in the tweet, so we can see it @emilysmith2007 and also use our hashtag #stopchanges2atw. ….Please remember to include @DWPgovuk too!